The National Plan to Address Alzheimer's Disease is updated yearly by the Advisory Council on Alzheimer's Research, Care and Services. Below is a list of the current versions available online. 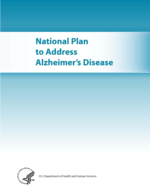 Other National Plan information, as well as an interactive index list of Goals and Strategies, is also available online at https://aspe.hhs.gov/national-plans-address-alzheimers-disease. Create and maintain an integrated national plan to overcome Alzheimer's disease. Coordinate Alzheimer's disease research and services across all federal agencies. Accelerate the development of treatments that would prevent, halt, or reverse the course of Alzheimer's disease. Improve early diagnosis and coordination of care and treatment of Alzheimer's disease. Improve outcomes for ethnic and racial minority populations that are at higher risk for Alzheimer's disease. Coordinate with international bodies to fight Alzheimer's globally. The law also establishes the Advisory Council on Alzheimer's Research, Care, and Services and requires the Secretary of HHS, in collaboration with the Advisory Council, to create and maintain a national plan to overcome Alzheimer's disease (AD). NAPA offers a historic opportunity to address the many challenges facing people with Alzheimer's disease and their families. Given the great demographic shifts that will occur over the next 30 years, including the doubling of the population of older adults, the success of this effort is of great importance to people with AD and their family members, public policy makers, and health and social service providers. Immediately increasing Alzheimer's disease research funding. The National Institutes of Health (NIH) immediately dedicated an additional $50 million from its fiscal year 2012 funding to Alzheimer's disease research. Sustaining and growing the Alzheimer's disease research investment. The President's fiscal year 2013 budget proposes $80 million in new Alzheimer's disease research funding. Together, the fiscal years 2012 and 2013 investments would total $130 million in new Alzheimer's disease research funding over two years. This initiative aims to take immediate action on Alzheimer's disease without waiting for Congress to act. And, it provides support for ideas being developed through this National Plan. This is the first National Plan. This plan includes a detailed listing of current federal activities and, as directed by NAPA, initial recommendations for priority actions to expand, eliminate, coordinate or condense programs. The activities outlined in this plan vary in scope and impact and include: (1) immediate actions that the federal government will take; (2) actions toward the goals that can be initiated by the federal government or its public and private partners in the near term; and (3) longer-range goals that will require numerous actions to achieve. This is a National Plan and not a federal plan. It will require the active engagement of public and private sector stakeholders to achieve. In the case of many of the long-range goals, the path forward will be contingent on resources, scientific progress, and focused collaborations across many partners. Over time, HHS will work with the Advisory Council and stakeholders to add additional transformative actions. A critical part of optimizing resources is ensuring coordination of the implementation of the National Plan with implementation of other HHS-wide plans and strategies, including Multiple Chronic Conditions: A Strategic Framework (2010), the HHS Action Plan to Reduce Racial and Ethnic Health Disparities (2011), National Prevention Strategy (2011), and HHS Strategic Plan (2010-2015). Appendix 2 provides a crosswalk of the Goals and Strategies of this plan with the Goals, Objectives, and Strategies of these related efforts. The alignment of these plan components will facilitate progress across plans as they are each carried out. In this plan, the term "Alzheimer's disease," or AD, refers to Alzheimer's disease and related dementias, consistent with the approach Congress used in NAPA. Related dementias include frontotemporal, Lewy body, mixed, and vascular dementia. It is often difficult to distinguish between Alzheimer's disease and other dementias in terms of clinical presentation and diagnosis. Some of the basic neurodegenerative processes have common pathways. People with dementia and their families face similar challenges in finding appropriate and necessary medical and supportive care. Unless otherwise noted, in this plan AD refers to these conditions collectively. In more than 90 percent of people with Alzheimer's disease, symptoms do not appear until after age 60, and the incidence of the disease increases with age. The causes of AD are not completely understood, but researchers believe they include a combination of genetic, environmental, and lifestyle factors.6 The importance of any one of these factors in increasing or decreasing the risk of developing AD may differ from person to person. In rare cases, known as early or younger-onset AD, people develop symptoms of AD in their 30s, 40s, or 50s. A significant number of people with Down syndrome also develop dementia in their 50s. AD is a major public health issue and will increasingly affect the health and well-being of the population. Unless the disease can be effectively treated or prevented, the number of Americans with AD will increase significantly in the next two decades. The number of people age 65 and older in the U.S. is expected to grow from 40 million in 2010 to 72.1 million in 2030. The prevalence of people with AD doubles for every 5-year interval beyond age 65. The significant growth in the population over age 85 that is estimated to occur between 2010 and 2030 (from 5.5 million to 8.7 million) suggests a substantial increase in the number of people with AD. Caring for people with Alzheimer's disease also strains the health and long-term care systems. Individuals with Alzheimer's disease use a disproportionate amount of health care resources; for instance, they are hospitalized 2-3 times as often as people the same age who do not have the disease.9 Similarly, while people living in nursing homes are a small percentage of the older population, nearly half (48%) of nursing homes residents have Alzheimer's disease.10 As the number of people with AD grows over the next two decades, this disease will place a major strain on these care systems as well as on Medicare and Medicaid, the major funders of this care. While research on AD has made steady progress, there are no pharmacological or other interventions to definitively prevent, treat, or cure the disease. While HHS and other groups have taken steps to develop quality measures to assess Alzheimer's care and to improve the training of the health and long-term care workforce, there is room for improvement. Stigmas and misconceptions associated with AD are widespread and profoundly impact the care provided to and the isolation felt by people with AD and their families. Public and private sector progress is significant but should be coordinated and tracked. In addition, data to track the incidence, prevalence, trajectory and costs of AD are limited. The enactment of NAPA creates an opportunity to focus the Nation's attention on the challenges of AD. In consultation with stakeholders both inside and outside of the federal government, this National Plan represents the initial blueprint for achieving the vision of a Nation free of AD. Central to and guiding the National Plan are the people most intimately impacted by Alzheimer's Disease -- those who have the disease and their families and other caregivers. Individuals with AD and their caregivers receive assistance from both the clinical health care system and support systems such as long-term care, home care, legal services, and other social services. Both the clinical care and support environments need better tools to serve people with Alzheimer's disease and their caregivers. Ongoing and future research seeks to identify interventions to assist clinicians, supportive service providers, persons with AD, and caregivers. All of these efforts must occur in the context of improved awareness of the disease and its impacts and the opportunities for improvement. The National Plan aims to address these key needs. HHS is committed to tracking and coordinating the implementation of NAPA and making improvements aimed at achieving its ambitious vision. Optimize existing resources and improve and coordinate ongoing activities. The first step in developing the National Plan was to set up a federal interagency working group and conduct an inventory of all federal activities involving AD (Appendix 3). In creating the plan, HHS and its partners sought to leverage these resources and activities, improve coordination, and reduce duplication of efforts to better meet the challenges of Alzheimer's disease. The activities included in the inventory comprise ongoing work and new opportunities created by the Affordable Care Act. The federal working group process has already led to improved coordination and awareness throughout the federal government and set in motion commitments for further collaboration. Further, this process has allowed for identification of non-AD-specific programs and resources that may be leveraged to advance AD care. Support public-private partnerships. The scope of the problem of Alzheimer's disease is so great that partnerships with a multitude of stakeholders will be essential to making progress. This National Plan begins the partnership process by identifying areas of need and opportunity. The plan relies on the Advisory Council in particular to identify key areas where public-private partnerships can improve outcomes. Transform the way we approach Alzheimer's disease. The National Plan represents a first step in an undertaking that will require large-scale, coordinated efforts across the public and private sectors. With principles 1 and 2 above, as well as the ambitious vision that the federal government is committing to through this National Plan, HHS and its federal partners seek to take the first of many transformative actions that will be needed to address this disease. Through an ongoing dialogue with the Advisory Council, the federal government will identify the most promising areas for progress and marshal resources from both within and outside the government to act on these opportunities. Research continues to expand our understanding of the causes of, treatments for, and prevention of Alzheimer's disease. This goal seeks to develop effective prevention and treatment modalities by 2025. Ongoing research and clinical inquiry can inform our ability to delay onset of Alzheimer's disease, minimize its symptoms, and delay its progression. Under this goal, HHS will prioritize and accelerate the pace of scientific research and ensure that as evidence-based solutions are identified they are quickly translated, put into practice, and brought to scale so that individuals with Alzheimer's disease can benefit from increases in scientific knowledge. HHS will identify interim milestones and set ambitious deadlines for achieving these milestones in order to meet this goal. Key to advancing this goal is the Obama Administration's investment of $50 million in new Alzheimer's disease research funding in fiscal year 2012 and $80 million in new Alzheimer's disease research funding in fiscal year 2013. These investments will open new opportunities in Alzheimer's disease research and jumpstart efforts to reach the 2025 goal. Research agencies undertake research planning processes on an ongoing basis, but a special effort is needed to identify the priorities and milestones to achieve Goal 1. The actions below will identify the priorities, establish milestones, and ensure that appropriate stakeholders are involved in the planning process aimed at minimizing Alzheimer's disease as a health burden by 2025. During the course of this work, NIH will develop research priorities, and a plan for implementing each phase of research in a coordinated manner. Coordination will occur across NIH Institutes and other Federal research agencies and with the private sector, as appropriate. In May 2012, the National Institute on Aging (NIA) of the National Institutes of Health will convene a research summit, Alzheimer's Research Summit 2012: Path to Treatment and Prevention, to provide expert input into identification of research priorities, to explore public and private research collaborations, and to establish strategies and milestones for an ambitious plan to slow progression, delay onset, and prevent Alzheimer's disease. The summit will include national and international experts in Alzheimer's disease and dementia research, public and private stakeholders, and members of the Advisory Council on Alzheimer's Research, Care, and Services. Summit proceedings will be open to the public. HHS will continue to seek input and feedback from the public on its Alzheimer's disease research. Specifically, NIA will issue a Request for Information (RFI) to invite public and private input on funded research addressing Alzheimer's disease and related dementias. HHS and its federal partners will use the input received through the Alzheimer's disease summit and the RFI to inform implementation of the National Plan. An updated Goal 1 will reflect the priorities, milestones, and timeline elements identified through these processes to accelerate research in this area. These will be incorporated into the next iteration of the National Plan and will be updated on an annual basis with the input of the Advisory Council. HHS will expand the work undertaken in Actions 1.A.1 and 1.A.2 to address non-Alzheimer's dementias. NIH will hold a scientific workshop in 2013 to solicit input on special research priorities and timelines for addressing related dementias. To ensure that the research priorities and milestones reflect the broad input of the scientific community and the public, one Advisory Council meeting per year will be focused on this area. A relevant subcommittee focused on research or Goal 1 will collect input and recommend priorities and milestones for consideration by the Advisory Council as official recommendations. As appropriate, researchers in the field will also be invited to present at these meetings. HHS and its federal partners will expand clinical trials on pharmacologic and non-pharmacologic ways to prevent Alzheimer's disease and manage and treat its symptoms. The federal government will address the challenge of enrolling enough people in clinical trials who are representative of the country's population, including ethnic and racial populations that are at higher risk for AD, through new partnerships and outreach. These actions will build on ongoing research focused on the identification of genetic, molecular and cellular targets for interventions and build on recent advances in the field. Incomplete understanding of the disease mechanisms that lead to AD is a major barrier to the discovery of effective therapies. An integrated interdisciplinary basic science research agenda will continue to advance our understanding of the molecular, cellular, and tissue level mechanisms and networks involved in the AD disease process to enable the identification and selection of therapeutic targets. NIH will undertake a new initiative to conduct whole genome sequencing to identify areas of genetic variation that correspond to increased risk (risk factors) or decreased risk (protective factors) of AD. This research is expected to yield novel targets for drug development, provide improved diagnostics for screening and disease monitoring, and ultimately help define strategies for disease prevention. Increased enrollment in clinical trials is crucial for the development of better treatments and ultimately a cure for AD. Participating in clinical trials and other research enables volunteers to access the latest experimental approaches available and provides them with care by clinical research staff. HHS will convene representatives from across the federal government, state and local governments, academic medical research institutions, and the private sector to create an action plan for increasing enrollment in clinical trials, including through the building of registries. The partners will identify approaches and coordination points for these efforts to implement the action plan. NIH will monitor enrollment of racial and ethnic minorities in NIH Alzheimer's disease studies and work with other research funders to do the same. NIH will use this information to identify next steps for engaging and enhancing research participation by racial and ethnic minorities. HHS and the Department of Veterans Affairs (VA) will continue to develop and conduct clinical trials on the most promising pharmaceuticals for the prevention and treatment of Alzheimer's disease. NIA is a primary funder of large investigator-initiated clinical trials including the Alzheimer's Disease Cooperative Study (ADCS). Clinical trials will continue to advance the development of interventions and evaluate their effectiveness. HHS will increase the pace of work under its cooperative agreement with VA and other federal agencies to advance the progress of clinical trials. HHS will coordinate these efforts with those occurring in the private sector, as appropriate, by pursuing appropriate planning and research partnerships. HHS and its federal partners will continue to conduct clinical trials to test the effectiveness of lifestyle interventions and risk factor reduction in the prevention of AD, conduct peer review of new grant applications, perform annual reviews of ongoing studies, and work to identify emerging opportunities for the development of new interventions. Significant advances in the use of imaging and biomarkers in brain, blood, and spinal fluids have made it possible to detect the onset of Alzheimer's disease, track its progression, and monitor the effects of treatment in people with the disease. Without these advances, these neurodegenerative processes could only be evaluated in non-living tissues. Accelerated research will improve and expand the application of biomarkers in research and practice. These advances have shown that the brain changes that lead to Alzheimer's disease begin up to 10 years before symptoms.13 Identifying imaging and other biomarkers in presymptomatic people will facilitate earlier diagnoses in clinical settings, as well as aid in the development of more efficient interventions to slow or delay progression. HHS will expand its work to identify imaging and biomarkers through the public-private Alzheimer's Disease Neuroimaging Initiative (ADNI). This partnership will help identify and monitor disease progression, even in the early stages before individuals show symptoms of the disease. HHS will maximize the effectiveness of research findings in neuroimaging and biomarkers through partnerships, meetings, and conferences with the private sector, FDA, and other federal agencies. These collaborations will focus on how to translate findings into treatments and clinical practice, as well as help identify promising new areas of exploration. In order to facilitate communication and collaboration, build synergy, and leverage resources, it is imperative that research across nations and across funders be coordinated. The actions below will formalize the coordination process beyond HHS and the federal government and make research available to the public for input. Beginning in 2012, HHS will build on an ongoing effort by NIA to complete, disseminate, maintain, and annually update an inventory of national and international Alzheimer's disease research investments. This inventory will inform and facilitate coordination among researchers, their organizations, and funders. NIA will use the Alzheimer's disease research ontology, recently developed in collaboration with the Alzheimer's Association, as a framework for collecting, organizing, and comparing the portfolios of national and international public and private Alzheimer's disease research funders. HHS will compile the portfolio information and make it available to the public through a searchable online database. HHS will expand outreach to international partners on Alzheimer's disease research. NIA will continue to collaborate with the Canadian Institutes of Health Research and the Research Councils of the United Kingdom and reach out to the additional eight countries that are developing Alzheimer's disease or dementia research plans. HHS will invite these colleaguesand representatives of relevant international organizations, to meet and discuss ongoing research priorities, and to provide research project information and categorization for the inventory. Currently, promising research and interventions are published in the research literature and presented at scientific meetings. Additional steps are needed to highlight promising findings and to facilitate dissemination and implementation of effective interventions to the general public, medical practitioners, the pharmaceutical industry, and public health systems, quickly and accurately. HHS will convene a group to examine ways to speed up the processes for bringing pharmacological treatments to market, including: identifying and validating therapeutic targets; developing new interventions; testing efficacy and safety; and regulatory approval. The group will look at the current average time and will identify places where the timeline could be shortened. The group will include representatives from the Food and Drug Administration, the Office of the Assistant Secretary for Planning and Evaluation (ASPE), and NIH who will consult with academic researchers and representatives from the private sector. HHS will expand its work to disseminate research findings. NIH will partner with other federal agencies to disseminate research findings to networks of providers and researchers. FDA will work with the pharmaceutical and medical device industries to clarify the types and characteristics of data needed for approval and clinical implementation. Other HHS and federal partners will form collaborations to promote the translation of evidence-based findings to community and practice settings. For example, the Administration on Aging (AoA) and NIH will continue their collaboration on translational research focused on helping older adults maintain their health and independence in the community. Additionally, AoA and CDC will build upon current collaborative efforts between public health and aging services networks to disseminate these findings. HHS will explore partnerships with stakeholder groups to facilitate further dissemination. HHS, VA, and other federal agencies will expand their outreach efforts to more effectively inform the public about research findings, including results from clinical trials and studies regarding the non-pharmacological management of physical, cognitive, emotional, and behavioral symptoms. The NIA's Alzheimer's Disease Education and Referral (ADEAR) Center will continue its focus in this area, and work with AoA and the Centers for Disease Control and Prevention (CDC) to expand outreach to include the findings of studies that center on community and public health interventions. Providing all people with Alzheimer's disease with the highest-quality care in the most efficient manner requires a multi-tiered approach. High-quality care requires an adequate supply of culturally-competent professionals with appropriate skills, ranging from direct-care workers to community health and social workers to primary care providers and specialists. High-quality care should be provided from the point of diagnosis onward in settings including doctor's offices, hospitals, people's homes and nursing homes. Care quality should be measured accurately and coupled with quality improvement tools. Further, care should address the complex care needs that persons with AD have due to the physical, cognitive, emotional, and behavioral symptoms of the disease and any co-occurring chronic conditions. High-quality and efficient care is dependent on smooth transitions between care settings and coordination among health care and long-term services and supports providers. To educate health care providers on ways to better identify and treat Alzheimer's disease and its symptoms, the Obama Administration's Alzheimer's disease announcement includes a new $6 million investment over two years for provider education and outreach. Provider training and awareness is essential to effectively detecting Alzheimer's disease and caring for people affected by this devastating disease. The workforce that cares for people with Alzheimer's disease includes health care and long-term services and supports providers such as primary care physicians; specialists such as neurologists, geriatricians, and psychiatrists; registered nurses and advanced practice nurses; community health workers; social workers; psychologists; pharmacists; dentists; allied health professionals; and direct-care workers like home health aides and certified nursing assistants, who provide care at home or in assisted living or nursing homes. These providers need accurate information about caring for someone with Alzheimer's disease including the benefits of early diagnosis, how to address the physical, cognitive, emotional, and behavioral symptoms of the disease, and how to assist caregivers as they cope with the physical and emotional aspects of their caregiving responsibilities. Physicians and other health care providers need information on how to implement the "detection of any cognitive impairment" requirement in the Medicare Annual Wellness Visit included in the Affordable Care Act. Major efforts by both VA and the Health Resources and Services Administration (HRSA), including expanded training opportunities created in the Affordable Care Act, support geriatric training for physicians, nurses, and other health workers.14 Enhanced specialist training is also needed to prepare these practitioners for the unique challenges faced by people with Alzheimer's disease. In addition, work is needed to expand the capacity of the primary care community to serve people with Alzheimer's disease. Dementia-specific capabilities within the direct-care workforce need to be expanded and enhanced. The actions below will facilitate AD-specific training for care professionals in order to strengthen a workforce that provides high-quality care to people with Alzheimer's disease. HHS will undertake a comprehensive provider education effort targeting health care providers such as physicians, nurses, direct care workers and other professionals. The effort will be carried out through HRSA's Geriatric Education Centers and will focus on educating providers about Alzheimer's disease. It will include the latest clinical guidelines and information on how to work with people with the disease and their families. Health care providers will learn how to manage the disease while coordinating care in the context of other health conditions, and how to link people to support services in the community. Training will also discuss signs of caregiver burden and depression that providers should recognize and address. Health care providers will also be trained on the tools available to detect cognitive impairment and appropriate assessment processes for diagnosis of AD. These are being developed through a Centers for Medicare and Medicaid Services (CMS), NIA, and CDC collaboration to help providers detect cognitive impairment during office visits, such as the Medicare Annual Wellness Visit. HHS will enhance three programs that encourage providers to focus on geriatric specialties. The Comprehensive Geriatric Education Program, as mandated by the Affordable Care Act, provides traineeships to support students pursuing advanced degrees in geriatric nursing, long-term services and supports, and gero-psychiatric nursing. In addition, HRSA will continue to support training projects that provide fellowships for individuals studying to be geriatricians, geriatric dentists, or geriatric psychiatrists. These programs prepare professionals to address the needs of people with Alzheimer's disease through service rotations in different care settings. HRSA will also continue to support the career development of geriatric specialists in academia through the Geriatric Academic Career Awards Program. Currently 65 percent of these awardees provide interprofessional clinical training on Alzheimer's disease. HHS will create and market a clearinghouse of dementia curricula and practice recommendations for providers across the care continuum, including physicians, nurses, social workers, psychologists, other health care professionals, direct-care workers, and informal caregivers. The clearinghouse will be hosted on a publicly-available website and updated regularly. HHS will seek expert input from public and private entities in developing the clearinghouse and ensure that its content incorporates existing evidence-based guidelines. HHS will strengthen the nursing home direct-care workforce through new training focused on high-quality, person-centered care for people with AD. This program was established by Congress in the Affordable Care Act. The training will be released in Spring 2012, and will be available to all nursing homes to share with their staff. This training will be available for both new and established aides. HHS will coordinate with states to develop aging and public health workforces that are AD-capable and culturally competent. AoA will ask states to specify strategies to improve the AD-capability of the workforce in their State Aging Plans and relevant grant applications. These strategies may include enhancing Alzheimer's disease competencies among Aging Network staff, developing AD-capable community health and long-term care Options Counseling in Aging and Disability Resource Centers, and linking State Long-Term Care Ombudsmen programs to AD-specific training and resources. CDC will work with its partners to identify public health contributions at the state and local levels and continue to work with AoA on enhancing the interface of the aging and public health networks. Much of the work required to support caregivers and the direct-care workforce should and will occur at the local level. This is reflected in the many state-based plans to tackle Alzheimer's disease.15 Thus, HHS and its federal government partners will identify ways that are most helpful to support states and localities in their efforts such as conducting research and translating successful interventions that address management of AD symptoms, and supports for paid and unpaid caregivers. HHS will disseminate information about these interventions, and share best practices. Far too many people with Alzheimer's disease are not diagnosed until their symptoms have become severe.16 Timely diagnosis gives people with the condition and their families time to plan and prepare for the future, leading to more positive outcomes for both.17, 18 For many, the inability to access health care due to a lack of insurance is a major concern. This is particularly important for individuals with younger-onset disease who may not yet be eligible for Medicare. Much of that insecurity will be alleviated as the Affordable Care Act, with its elimination of pre-existing conditions limitations and expansion of insurance coverage, is implemented. Even with access to affordable care for individuals, the health care workforce needs tools that can help ensure timely and accurate diagnoses. Research has helped identify some assessment tools that can be used to detect cognitive impairment that may indicate the need for a comprehensive diagnostic evaluation for Alzheimer's disease.19 The actions below will facilitate appropriate assessment and give healthcare providers tools to make timely and accurate diagnoses. Family members and loved ones are often the first to notice symptoms of AD and report their concerns to medical professionals. Thus, public awareness of the potential symptoms of Alzheimer's disease is important for detecting AD and ensuring a timely, accurate diagnosis. Once warning signs are identified, people with these symptoms and their families need access to formal diagnostic and support services. To that end, HHS will expand linkages between its disease support and community information centers supported by NIH and AoA. NIH's Alzheimer's Disease Education and Referral (ADEAR) Center will continue to educate the public and providers about the latest evidence on the symptoms of AD and current methods of diagnosing the disease. AoA's National Alzheimer's Call Center will work with the Aging Network to help connect families and people with symptoms of AD with AD-capable resources, including diagnostic services through NIH-funded Alzheimer's Disease Centers when available. The Affordable Care Act created the Medicare Annual Wellness Visit. "Detection of any cognitive impairment" must be included as part of the wellness visit. HHS is using research findings to identify the most appropriate assessment tools that can be used in a variety of outpatient clinical settings to assess cognition. The recommended tools will be distributed to practitioners to aid in identification and evaluation of cognitive impairment. Once cognitive impairment has been detected, practitioners will be able to consider potential causes of cognitive impairment and determine the need for a comprehensive diagnostic evaluation for AD. Often, even though a physician or another health care provider has identified cognitive impairment, the patient and his or her family are not told of the diagnosis.20 Further, once a diagnosis is made and disclosed, as few as half of patients and families receive counseling, support, or information about next steps.21 This information is important, especially for early-stage patients who experience positive outcomes when they are involved in planning and receive appropriate services.22 The actions below will address this gap by educating physicians and other health care providers, incentivizing discussions with people with AD and their families, and enhancing the ability of other networks to assist people with Alzheimer's disease and their families with addressing their needs. One barrier to counseling and support is that health care providers are not aware of available services or how to access them. To increase knowledge of these resources among doctors, nurses, and hospitals, HHS will work with its federal partners, public and private entities, and the health care provider community to identify steps to effectively educate physicians and other health care providers about support resources and services available to assist people with AD and their caregivers. This work will be coordinated with the provider education effort in Action 2.A.1. Outside of the clinical-care setting, families and people with AD need specialized assistance in planning for AD-specific needs and accessing appropriate services. HHS will work to strengthen the ability of existing long-term services and supports systems, such as those provided by AoA's Aging Network, to meet the unique needs of people with AD and their caregivers. HHS will strengthen the Aging Network's awareness of available family caregiver assessment tools, resource materials from across the government, and support programs designed to educate caregivers and persons with the disease. Guidelines for delivery of high-quality care and measures of quality are needed to ensure people with Alzheimer's disease receive high-quality, culturally-competent care in the many different settings where they receive services. These guidelines should be tailored to the stages of the disease, address the physical, cognitive, emotional, and behavioral symptoms of AD, and cover the myriad care settings in which care is delivered. These guidelines should also take into account how care might be modified for diverse populations and in the context of co-occurring chronic conditions in people with AD. HHS will seek expert input from public and private entities and ensure that content builds on existing, evidence-based guidelines. Quality measures should be based on such guidelines and track whether recommended care is being provided. Guidelines and measures need to be free of conflicts of interest. The actions below will advance the development of guidelines and measures of high-quality care, as well as the ability of the provider community to improve the quality of the care they provide. HHS will work with private partners to facilitate groups such as medical professional societies and organizations representing persons with AD, caregivers, and direct care workers working together to delineate best dementia care practices and evidence-based guidelines. This work can serve to inform clinical, behavioral health, and long-term services and supports providers, families, and people with AD, and can also serve as a foundation to guide the identification and development of metrics that promote high-quality dementia care in all settings. The Affordable Care Act created the CMS Center for Medicare and Medicaid Innovation (CMMI) which is charged with testing innovative payment and service delivery models to reduce expenditures in Medicare and Medicaid while maintaining or enhancing the quality of care received by program beneficiaries. While these studies are not designed to focus on people with AD in particular, a number of the initiatives underway at CMMI may provide information relevant to the care for people with Alzheimer's disease. The Secretary can expand the duration and scope of care models that are shown to reduce spending and improve quality, including implementing them at a national level. Through the actions below, HHS will leverage the efforts that are already underway at CMMI as potential new AD-specific initiatives are identified. Medical homes utilize a team approach to provide care and to improve the quality and coordination of health care services. CMMI is currently carrying out the Multi-payer Advanced Primary Care Practice Demonstration and the Comprehensive Primary Care initiative to measure the effectiveness of medical home models. CMMI will conduct subgroup analyses to examine changes in care quality and care coordination among people with AD to explore whether these models lead to more effective and efficient care. The Independence at Home Demonstration is testing a payment and service system that uses physicians and nurse practitioners to coordinate home-based primary care with long-term services and supports. CMMI will conduct subgroup analyses to examine whether health and functional status outcomes are improved among people with AD in this demonstration. The Partnerships for Patients is a public-private partnership that helps improve the quality of care and safety in hospitals. Through this initiative, hospitals will identify best practices for reducing injuries, complications, and improving care transitions. CMMI will identify practices that benefit people with complex needs including people with Alzheimer's disease. CMS will share these findings broadly. HHS will examine how to improve care during transitions for people with Alzheimer's disease through Medicare's Community-Based Care Transitions Program and the Aging and Disabilities Resource Center (ADRC) Evidence-Based Care Transitions Program. Medicare's Community-Based Care Transitions Program is an ongoing demonstration that links hospitals with community-based organizations to encourage shared quality goals, improve transitions, and optimize community care. The ADRC Evidence-Based Care Transitions program supports state efforts to strengthen the role of ADRCs in implementing evidence-based care transition models that meaningfully engage older adults, individuals with disabilities, and their informal caregivers. Coordinating the care received by people with Alzheimer's disease in different settings by different providers can help reduce duplication and errors and improve outcomes.24 Despite a general consensus that care coordination is important, more research is needed to determine how best to provide such care in a high-quality and cost-efficient manner. The actions under this strategy will focus on learning from the existing evidence regarding care coordination and using this information to implement and evaluate care coordination models for people with AD. HHS will convene federal partners and outside experts to review the research on care coordination models for people with Alzheimer's disease. This review will include an in-depth examination of promising models of care to help identify key components that improve outcomes for people with AD. HHS will also review the evidence comparing the effectiveness of structures, processes, and interventions on health, psychosocial, and functional outcomes of people with AD in long-term care settings and their caregivers. HHS will support states in developing new approaches to better coordinate care for people who are enrolled in both Medicare and Medicaid, many of whom have cognitive impairments. CMS has established a new technical assistance resource center, the Integrated Care Resource Center, authorized under the Affordable Care Act, to assist states in designing and delivering coordinated health care to beneficiaries. HHS will evaluate the impact of these models. The CMS Center for Medicare and Medicaid Innovation, in partnership with the CMS Medicare-Medicaid Coordination Office, provides an opportunity to test and evaluate promising models of care for people with AD. Some populations are unequally burdened by Alzheimer's disease, including racial and ethnic minorities and people with intellectual disabilities. Racial and ethnic minorities are at greater risk for developing Alzheimer's disease and face barriers to obtaining a diagnosis and services after onset. People with Down syndrome almost always develop AD as they age. In addition, because AD primarily affects older adults, the population with younger-onset AD faces unique challenges with diagnosis, care, and stigma. HHS will undertake the actions below to better understand the unique challenges faced by these groups and create a plan for improving the care that they receive, which will be integrated into the broader efforts to improve care for all people with AD. HHS will convene one or more groups of experts, both within and outside of the government, to take steps to address the unique care challenges faced by people with younger-onset Alzheimer's disease, racial and ethnic minorities, and people with Down syndrome and other intellectual disabilities. This group will focus on how to improve accurate and timely diagnosis, access to care, education on AD for practitioners who do not normally specialize in care for people with AD, and special considerations for these populations. The Administration on Aging (AoA), Office on Disability, and Administration on Developmental Disabilities (ADD) will work together to address access to long-term services and supports for younger people, including people with Down syndrome and other intellectual disabilities who develop AD early and people with younger-onset AD. Together these agencies will identify barriers to these supports and make recommendations to the Advisory Council and HHS on ways to address these barriers. People with Alzheimer's disease and their families need supports that go beyond the care provided in formal settings such as doctor's offices, hospitals, or nursing homes. Families and other informal caregivers play a central role. Supporting people with Alzheimer's disease and their families and caregivers requires giving them the tools that they need, helping to plan for future needs, and ensuring that safety and dignity are maintained. Under this goal, the federal government and partners will undertake strategies and actions that will support people with the disease and their caregivers. To help respond to the challenges faced by families and other caregivers, the Obama Administration's Alzheimer's disease announcement proposes a new investment of $10.5 million in fiscal year 2013 to support the needs of caregivers of people with Alzheimer's disease. Caregivers report that they feel unprepared for some of the challenges of caring for a person with Alzheimer's disease -- for example, caring for a loved one with sleep disturbances, behavioral changes, or in need of physical assistance can be an enormous challenge.25 Giving caregivers the information and training that they need in a culturally sensitive manner helps them better prepare for these and other challenges. The actions to achieve this strategy include identifying the areas of training and educational needs, identifying and creating culturally-appropriate materials, and distributing these materials to caregivers. HHS will review culturally sensitive AD resources and identify areas where new resources need to be developed. HHS and private entities will develop relevant new culturally sensitive AD resources as needed. HHS will work with its agencies, other federal departments, and state and local networks and tribal governments to distribute training and education materials. This will include dissemination through the Aging Network, the public health network, and public websites. Reports from the National Research Council have reinforced the need for health information technology (HIT) applications for caregivers as well as people with AD and providers.26, 27 Many opportunities exist for using technology to support people with AD and their caregivers. Opportunities include assistance with reminders, communications, and monitoring. HHS will identify an agenda for priority actions to support the use of technology to assist caregivers and persons with the disease. Even though informal caregivers usually prefer to provide care to their loved ones in their home or other community settings, eventually the round-the-clock care needs of the person with AD may necessitate nursing home placement. While they are providing care, supports for families and caregivers can help lessen feelings of depression and stress and help delay nursing home placement.28, 29, 30 The actions below will further support informal caregivers by identifying their support needs; developing and disseminating interventions;giving caregivers information they need, particularly in crisis situations; and assisting caregivers in maintaining their health and well-being. HHS will analyze surveys and datasets, such as the Caregiver Supplement to the National Health and Aging Trends Study, to identify the service needs of caregivers of people with AD. These findings will be published and disseminated to federal partners and the public. HHS will also meet with state and local officials and stakeholders to discuss unmet needsin their communities. While most states conduct caregiver assessments through their long-term services and supports system, there is not consistent information about best practices in caregiver assessment. HHS will explore a public-private partnership to identify best practices in caregiver assessment and referral. This effort will examine caregiver assessment tools used in states, including those used in state Medicaid waiver programs. Best practices related to caregiver assessment will be disseminated. HHS will partner with private organizations to convene a meeting of leading scientists and practitioners to review the state of the art of research and translational activities related to evidence-based interventions that can be delivered by community-based organizations. The meeting will be focused on interventions that have been effective in improving the health and well-being of persons with Alzheimer's disease and their caregivers. The outcome of the meeting will be a white paper outlining strategies for Identifying promising interventions for research, translation, and expansion into practice at the community level. HHS will expand its support for research and conduct trials, systematic reviews, and demonstration projects for evidence-based interventions to support individuals with Alzheimer's disease and their caregivers, work to identify emerging opportunities for the development of new interventions, and translate and disseminate findings immediately. AoA will expand efforts to develop more AD-capable long-term services and supports systems designed to meet the needs of AD caregivers. Through these efforts, AoA will work with lead state agencies across state government and with the Aging Network to identify and address caregivers' needs when they seek assistance from state or local home and community-based services systems for themselves or for the person with AD. Caregivers will be connected to supportive services such as respite care. Caregivers will be linked to interventions shown to decrease burden and depression among caregivers and enhance the care received by people with Alzheimer's disease. As additional effective interventions are identified, HHS will work with its partners on implementation in appropriate settings. VA has a number of programs which support caregivers of Veterans, including the Caregiver Support Program, REACH-VA, Home-Based Primary Care, other in-home care and community-based services, and respite care. VA officials will share the lessons learned from implementing these programs and examining their impact on both caregivers and people with AD with other federal representatives through scheduled informational meetings. AoA's National Alzheimer's Call Center provides expert advice, care consultation, information, and referrals at the national and local levels regarding Alzheimer's disease. Services include crisis counseling and detailed follow-through to ensure consumers receive appropriate and high-quality responses to their concerns. AoA and NIA, working with the National Alzheimer's Call Center and the Alzheimer's Disease Education and Referral (ADEAR) Center, will develop and present a webinar for the Aging Network, NIA-funded Alzheimer's Disease Centers, other federal partners highlighting the availability of the National Alzheimer's Call Center to support caregivers in crisis and disaster situations. The vast majority of people do not think about or plan for the long-term services and supports they will need until they experience a disability or AD. Many Americans incorrectly believe that Medicare will cover most of the costs of these supportive services.31, 32 Unfortunately, by the time care is needed, it is difficult to get coverage in the private long-term care insurance market, and options are limited.33 Educating people about their potential need for long-term services and supports and the significant advantages of planning ahead for these services encourages timely preparation. Planning ahead can help ensure that individuals with AD receive care in the setting they prefer and that their dignity is maintained. HHS is working to better understand why middle-aged adults do or do not plan for long-term care needs. HHS will conduct a national survey to examine attitudes toward long-term care. It will also identify barriers to long-term care planning. HHS will expand public knowledge of the risks of Alzheimer's disease and the implications for future care needs through the Long-Term Care Awareness Campaign. Since 2005, the Campaign has been making individuals and families more aware of their potential need for long-term services and supports and the significant advantages of planning ahead. HHS will incorporate information about Alzheimer's disease into its materials for the Campaign. People with Alzheimer's disease are particularly vulnerable to financial exploitation, physical or emotional abuse, and neglect both at home and in care facilities.34 Reports of elder abuse are handled by state Adult Protective Services (APS), which investigate allegations, provide protective services, and refer cases to law enforcement when appropriate. Not all APS programs cover residents of long-term care facilities. State survey and certification agencies receive funding from CMS to survey Medicare or Medicaid-certified nursing facilities and to investigate abuse complaints in these facilities. State licensing agencies may investigate complaints of abuse in other types of facilities, such as assisted living. State Long-Term Care Ombudsman programs advocate for residents of nursing homes and other adult care facilities, and work to resolve complaints on behalf of residents, including those related to abuse, neglect, and exploitation. The actions below will help ensure that people with AD have their dignity, safety, and rights maintained. HHS will work to educate legal service professionals about the vulnerabilities of people with Alzheimer's disease and how to most effectively serve this population by developing and providing AD-specific training through AoA's National Legal Resource Center (NLRC). HHS has identified the inappropriate use of some medications, including anti-psychotic drugs, to manage difficult behaviors of nursing home residents, many of whom have Alzheimer's disease. CMS is leading a collaborative effort to reduce inappropriate and off-label use of antipsychotic and behavior modifying agents in nursing homes. This will be achieved through a multifaceted approach that includes updated surveyor guidance, stricter enforcement of rules, efforts to eliminate conflicts of interest by pharmacists, and, in partnership with the Alzheimer's Disease Education and Referral (ADEAR) Center, education of providers, prescribers, surveyors and families. Stable housing is essential to helping people with Alzheimer's disease remain in the community, particularly as they experience an increasing need for services and supports as the disease progresses. Housing is a crucial platform for delivering the necessary health and supportive services. Recognizing these links, HHS and the Department of Housing and Urban Development (HUD) are working together to improve health outcomes and housing stability through supportive services for vulnerable populations including people with AD. Through the actions below, HHS will assess the availability of services in the settings where people with Alzheimer's disease live. This information will form the basis of future actions to further link housing with services for people with AD. HUD and HHS will explore models of affordable housing that provide coordinated housing, health and long-term services and supports for individuals as they age in the community. This work will include examining housing sites that link health and long-term services and supports. In addition, the project will link HUD and HHS data to understand the older adult population in HUD housing, including their health care utilization. HHS will undertake analyses of existing studies and surveys to better understand where people with Alzheimer's disease live and the availability of services in these settings. This will include an in-depth analysis of the National Survey of Residential Care Facilities to better understand the level of cognitive impairment among residents and the types of services provided in assisted living facilities. The results of these studies will be used to identify areas that the National Plan should address in future years. Most of the public is aware of Alzheimer's disease; more than 85 percent of people surveyed can identify the disease and its symptoms. Alzheimer's disease is also one of the most-feared health conditions. Yet there are widespread and significant public misperceptions about diagnosis and clinical management.35 Misperceptions lead to delayed diagnosis and to people with the disease and their caregivers feeling isolated and stigmatized. Enhancing public awareness and engagement is an essential goal because it forms the basis for advancing the subsequent goals of the National Plan. A better understanding of Alzheimer's disease will help engage stakeholders who can help address the challenges faced by people with the disease and their families. These stakeholders include a range of groups such as health care providers who care for people with AD and their caregivers, employers whose employees request flexibility to care for a loved one with the disease, groups whose members are caregivers, and broader aging organizations. The strategies and actions under this goal are designed to educate these and other groups about the disease. The Obama Administration's Alzheimer's disease announcement invests $8.2 million over two years, beginning this year, to support public awareness and to improve public knowledge and understanding of Alzheimer's disease. Greater public awareness of AD can encourage families to seek assessment, reduce isolation and misunderstanding felt by caregivers, and help link people in need to accurate information, resources and services. HHS will design a multifaceted public awareness, outreach, and education initiative. The initiative will be carried out in collaboration with federal partners, states, local governments, and non-governmental entities. Formative research on population targets and the perceptions of diverse populations regarding AD will inform the initiative. State, tribal, and local governments are working to help address challenges faced by people with Alzheimer's disease and their caregivers. Nineteen states and a handful of local entities have published plans to address AD that cover many of the same issues as the National Plan. Leveraging the available resources and programs across these levels of government will aid in the success of these efforts. HHS will convene national leaders from state, tribal, and local government organizations to identify steps for increasing AD awareness and readiness in their jurisdictions. These leaders will create an agenda for partnering and supporting the efforts described in this National Plan. HHS will engage key stakeholders from a range of constituencies whose participation is important for the success of this effort. The Interagency Group on Alzheimer's Disease and Related Dementias, convened on an ongoing basis since April 2011, provides a forum for discussion of AD efforts across federal departments and agencies. Participants in this group have gained a better understanding of the roles and responsibilities of other departments and agencies for addressing Alzheimer's disease. Together, the group has identified existing resources and new opportunities for collaboration, best practices, and initiatives. HHS will continue to convene federal partners to collaborate on Alzheimer's disease. The group will share research findings, innovative or best practices, and information about new or upcoming initiatives. Many nations have developed Alzheimer's plans of their own that involve improved care and supports for people with Alzheimer's disease and their caregivers, as well as enhanced research and public awareness. In implementing the actions in this plan, HHS and its federal partners will coordinate with global partners to enhance these plans, avoid duplication of effort, and optimize existing resources. HHS will expand outreach to international partners on Alzheimer's disease through its Office of Global Affairs and other relevant federal agencies. HHS will invite colleagues and representatives of other countries and international organizations to meet and discuss ongoing Alzheimer's disease plans. These meetings will focus on shared research agendas, recent research findings, best practices in care across the continuum, and supports for informal caregivers. The federal government is committed to better understanding AD and its impact on people with the disease, families, the health and long-term care systems, and society as a whole. Data and surveillance efforts are paramount to tracking the burden of AD on individual and population health and will be used to identify and monitor trends in risk factors associated with AD, and assist with understanding health disparities among populations such as racial and ethnic minorities. HHS will make efforts to expand and enhance data infrastructure and make data easily accessible to federal agencies and other researchers. This data infrastructure will help HHS in its multi-level monitoring and evaluation of progress on the National Plan. The Obama Administration's Alzheimer's disease announcement responds to this goal with a proposal to invest $1.3 million in fiscal year 2013 to improve data collection to better understand Alzheimer's disease's impact on people with the disease, their families and the health care system. The federal government needs improved data on people with Alzheimer's disease, their caregivers, and the care and supports that they use to address policy questions and plan and evaluate new initiatives. HHS and its partners will identify the policy questions that cannot be answered with existing data, as well as questions likely to arise in the future. These questions will provide a mechanism for identifying gaps, challenges, and changes or additions to data collection. HHS will convene federal partners to identify current and future policy research questions that cannot be answered with existing data. Some topics this group will discuss include Medicare and Medicaid expenditures among people with Alzheimer's disease, as well as the impact of caregiver supports on health outcomes. The partners will identify gaps in data to evaluate progress on the National Plan that should be addressed. HHS will work with federal partners and researchers to identify the data and data infrastructure needed to address the policy issues identified in Action 5.A.1. These changes or additions may include new or improved measures, new data collection efforts, or links between existing data sets. HHS will address the identified data needs or possible improvements and develop questions to be fielded for data collection. These questions will be added to existing surveys, be part of supplements to existing surveys, or form the basis of a new survey. The National Plan is intended to be a roadmap for accomplishing its five goals. It is a document that is designed to be updated regularly. HHS is committed to tracking progress and incorporating findings into an updated National Plan. HHS will designate an office and a contact person responsible and accountable for implementing each action step in the National Plan. The Office of the Assistant Secretary for Planning and Evaluation (ASPE) will be responsible for overseeing implementation, reporting on progress, convening the Advisory Council on Alzheimer's Research, Care, and Services, and issuing reports to Congress. HHS will monitor progress to determine whether actions are being completed as stated in the National Plan and the extent to which implemented actions contribute to the desired outcomes and changes associated with each strategy. HHS and its federal partners will identify challenges to the successful completion of strategies and actions and make recommendations for how they can be addressed. For each strategy, HHS will monitor available population-based data, such as the National Health and Aging Trends Study, Medicare Current Beneficiary Survey, or the Behavioral Risk Factor Surveillance System to assess the extent to which progress is being made. HHS will use data from both the public and private sectors, as appropriate, to track progress on the National Plan. Additionally, HHS will work to incorporate measures related to AD into other surveillance efforts to monitor population health, such as Healthy People 2020 which, for the first time incorporates objectives related to AD. For each action, HHS will track implementation to determine whether actions are completed in a timely and successful manner. Appendix 4 provides a timeline, method of action, and identifies lead and partner agencies for each action step in the plan. Progress on each of these actions will be reported biannually to the Advisory Council. Tracking progress will help HHS and the Advisory Council monitor progress towards the goals of the National Plan and make recommendations for priority actions and updates to the Plan. HHS will incorporate its findings and the recommendations of the Advisory Council to update the National Plan on an annual basis. Goal 4: Facilitate research to fill knowledge gaps about, and interventions and systems to benefit, individuals with multiple chronic conditions. Goal 1: Foster health care and public health system changes to improve the health of individuals with multiple chronic conditions. Goal 3: Provide better tools and information to health care, public health, and social services workers who deliver care to individuals with multiple chronic conditions. Goal 2: Maximize the use of proven self-care management and other services by individuals with multiple chronic conditions. Objective B: Facilitate home and community-based services. The National Alzheimer's Project Act (NAPA), enacted in 2011, requires the Secretary of the U.S. Department of Health and Human Services (HHS) to establish a national plan to address Alzheimer's disease. NAPA requires coordination of Alzheimer's research and services across all federal agencies and an annual assessment of the nation's progress in preparing for the escalating burden of Alzheimer's disease. One of the requirements of NAPA is an initial evaluation of all federally funded efforts in Alzheimer's research, clinical care, and institutional, home, and community-based programs. Shortly after the legislation was passed, the Secretary of HHS established a Federal Interagency Group on Alzheimer's Disease and Related Dementias to develop an inventory of federal programs related to Alzheimer's disease. The interagency group created this inventory of federally-funded efforts in three broad categories: research, long-term services and supports, and clinical care. Representatives from various federal agencies reviewed the portfolios of programs administered by their agencies and identified those related to Alzheimer's disease in Fiscal Year 2010, the most recent year for which complete data were available. This appendix provides a summary of those federally-funded programs. Seven agencies within HHS -- the Administration on Aging, the Agency for Healthcare Research and Quality, the Centers for Medicare and Medicaid Services, the Centers for Disease Control and Prevention, the Health Resources and Services Administration, the National Institutes of Health, and the Substance Abuse and Mental Health Services Administration -- as well as the U.S. Department of Defense, the U.S. Department of Justice, and the U.S. Department of Veterans Affairs -- identified Alzheimer's disease-relevant programs. For FY2010, these agencies reported a combined total of 1,428 programs and projects, across 14 categories of research, clinical care, and long-term services and supports that address Alzheimer's disease. However, this is only a subset of the federal activities that support people with Alzheimer's disease and their caregivers. Because people with Alzheimer's disease or their caregivers are covered by broader programs and data limitations make it difficult to specifically identify these individuals and the services they receive, the Alzheimer's disease component of many federal programs could not be determined. Consistent with the approach in the NAPA legislation and National Plan, the term "Alzheimer's disease" refers to Alzheimer's disease and related dementias. Related dementias include frontotemporal, Lewy body, mixed, and vascular dementia. It is often difficult to distinguish between Alzheimer's disease and other dementias. Some of the basic neurodegenerative processes of these diseases have common pathways. People with dementia and their families face similar challenges in finding appropriate and necessary medical and supportive care. Unless otherwise noted, in this inventory Alzheimer's disease refers to these conditions collectively. In the report below, programs and initiatives are organized by these categories. In the Supplementary Material section at the end of the document, this material is presented in tabular form and organized by agency. Federally funded research on Alzheimer's disease includes a broad range of activities: basic and epidemiologic research, development of non-pharmacologic and pharmacologic treatments and interventions, clinical testing of the efficacy and safety of interventions, and development and implementation of regulatory processes across the research continuum. The FY 2010 Federal Inventory for research will be available in more detail and updated annually at http://www.nia.nih.gov/research/dn/international-alzheimers-disease-research-portfolio. Several of the grant mechanisms supported by Federal agencies are used to promote multidisciplinary and collaborative research. The overarching aim of the research within this category is to identify and understand the molecular, cellular and physiological mechanisms that cause Alzheimer's disease. The spectrum of research under this category includes studies on the genes that affect the risk for AD; molecular and cellular factors that may contribute to AD; and lifestyle risk factors. In addition, research under this category focuses on what makes nerve cells lose function and die, leading to loss of memory and eventually dementia. Findings from these studies are important in identifying potential targets for the prevention, diagnosis, and treatment of Alzheimer's disease. Basic research includes developing and first-line testing of new preventive and therapeutic compounds for Alzheimer's in preclinical models. Finding a reliable way to detect Alzheimer's disease early in its development is critical to devising future treatments that may delay, prevent, or treat the disease. Studies show that changes in the brain caused by Alzheimer's disease may begin to develop years, even decades, before clinical symptoms become apparent. Researchers are developing blood and cerebrospinal fluid biomarkers, clinical assessments, and brain imaging technologies to diagnose AD as early as possible. Studies measuring changes in the structure and function of the brain and biomarkers measures may provide clues to pre-symptomatic AD and will allow researchers to gauge more efficiently the effectiveness of interventions in clinical trials. Once validated, these measures will also allow for the assessment of disease risk and cognitive function. Translational research brings knowledge from the laboratory and develops into new interventions that can be tested in clinical trials. Such research can then lead to the development of safe and effective interventions for Alzheimer's disease and mild cognitive impairment, often the first stage in the development of dementia. Clinical trials are now underway to test promising new drugs, behavioral interventions such as exercise, or a combination of interventions with the intention of moving successful interventions rapidly into clinical practice. Researchers are also testing the possible repurposing and reformulation of existing drugs already approved for other diseases and conditions and the development of other therapeutics. Much of this work involves innovative collaborations among scientists who focus on understanding the cellular, molecular, and pathologic dimensions of Alzheimer's disease and clinicians who focus on treating people with the disease. Epidemiological and longitudinal studies focus on understanding the scope and dimensions of Alzheimer's disease at the population level. They can help us identify initial clues to risk and protective factors that may be associated with disease development as well as specific populations that may be at increased risk. Researchers who conduct epidemiologic studies develop and test measures to track trends in prevalence and incidence, including trends among subpopulations, and correlate these trends with changes in environmental and biological factors. Understanding the scope and reach of cognitive impairment and Alzheimer's disease has important implications, including better understanding of the increased risk of disability and the need for supportive services for those with the disease and those who care for them. Research in this category includes projects that are developing interventions and strategies for improving quality of care for people with Alzheimer's disease (AD) across diverse populations in a variety of care settings. This category also addresses the unique needs of not only people with AD, but also those of their caregivers. It includes developing effective and culturally appropriate strategies to understand and help alleviate the stress, anxiety, depression and other health consequences often associated with caring intensely for someone with AD. Changes in biomarkers, mental health outcomes, and health behaviors are investigated as indicators of caregiving burden. In addition, this category includes research investigating the direct and indirect costs for the care of both the person with the disease and caregivers (both professional and unpaid). The research infrastructure enables high quality research across the entire continuum of research from basic science to development of therapies, clinical research and community health care. Funded resources include research centers that provide clinical, data management, administrative, educational and technological support to AD researchers. In addition, funded resources include data and tissue repositories such as brain banks and professional and career development training. These resources provide researchers with access to the technology and equipment they need to perform research at the highest levels and ensure the availability of a skilled, motivated, multidisciplinary work force. These activities also include workshops, symposia, and conferences to facilitate the dissemination of research findings to the scientific and health professional communities and to the public. Four agencies -- the National Institutes of Health, Centers for Disease Control and Prevention, Agency for Healthcare Research and Quality, and Department of Veterans Affairs -- identified relevant research in the six research categories. For FY2010, these agencies reported a combined total of 1,393 projects. Exhibit 1 provides numbers of projects across the six research categories for each of the four agencies. The Food and Drug Administration (FDA) and National Science Foundation (NSF) support research that may also have implications for, but are not specifically focused on, Alzheimer's disease. Clinical services encompass a broad range of medical, nursing, and other associated health services that are needed to, detect, diagnose, and manage Alzheimer's disease. It includes services across the care continuum such as ambulatory care, geriatric primary care, hospice, and across all stages of the disease. Medicare and Medicaid are the primary governmental payers for these services for those with AD who are aged 65 and over, as well as those who meet the categorical eligibility requirements for being considered disabled by these programs. In addition, the Department of Veterans Affairs provides health care for eligible Veterans, including those with AD. While none of its services are dementia specific, Medicare covers health, acute, and post-acute medical care for people aged 65 and older and for younger populations who meet the Social Security definition of disability. Medicare covers most, but not all, of the cost of inpatient hospital care, doctor's fees, and other medical expenses of people with Alzheimer's disease. Among other services, Medicare covers hospital care, limited skilled nursing facility care, medically-related home health care, outpatient services, durable medical equipment, and prescription drugs. Medicare Part D covers prescription drugs and is available to all Medicare beneficiaries through private insurance plans. All Medicare drug plans cover some medications commonly prescribed to treat Alzheimer's disease. All plans are required to cover at least two cholinesterase inhibitors and memantine. Medicare beneficiaries with a terminal illness, who are certified by a physician to have 6 months or less to live, are eligible for the Medicare hospice benefit. The Medicare hospice benefit includes nursing care, therapies, home health, medical supplies, respite care, bereavement care and other services. Medicaid also finances clinical services for some people with Alzheimer's disease. Most Medicaid beneficiaries who have Alzheimer's disease are also eligible for Medicare. In situations of dual eligibility, the role of Medicaid (not including Medicaid's important role in covering non-clinical long-term service and support needs) is primarily to pay the Medicare premiums, deductibles, and coinsurance and to cover some acute care services not covered by Medicare. For the relatively few Medicaid beneficiaries with Alzheimer's disease who are not also eligible for Medicare, Medicaid covers a comprehensive range of acute care services. No Medicaid service is dementia specific. VA provides eligible Veterans with outpatient and inpatient acute care and extended care services. VA's Geriatric Evaluation and Management program provides assessment and care by interdisciplinary teams in inpatient and outpatient settings for older Veterans with multiple medical, functional, and psychosocial problems and geriatric syndromes (e.g., falls). Geriatric evaluation -- the assessment and care plan development -- is required to be provided to all eligible Veterans who may benefit from it. The programs that Medicare and Medicaid, the VA, the Substance Abuse Mental Health Services Administration (SAMHSA), the Health Resources and Services Administration (HRSA) identified fall into three categories of clinical care: (1) Detection and diagnosis, (2) clinical management and care coordination, and (3) person and family centered goal setting. Clinical diagnosis of dementia often begins with the recognition of a progressive decline in memory; a decrease in the person's ability to perform activities of daily living; or psychiatric problems, personality changes, or problem behaviors. Because persons with Alzheimer's disease may use multiple care settings, providers in all settings need to have the skills to detect possible Alzheimer's disease and to refer a patient for differential diagnosis when necessary. Clinical management of Alzheimer's disease includes drug and non-drug services which may help with both cognitive and behavioral symptoms of the disease. A high percentage of persons with Alzheimer's disease have coexisting chronic medical conditions, the effective management of which involves coordination of care across health care settings. HRSA and CMS have been collaborating to reduce adverse drug events. They formed the Patient Safety and Clinical Pharmacy Services Collaborative (PSPC) to improve the quality of health care by integrating evidence-based clinical pharmacy services into the care and management of high-risk, high-cost, complex patients. The PSPC collaborative includes a joint effort focusing on the Medicare population often at higher risk secondary to polypharmacy or potentially inappropriate medication prescription and use. In addition, the Quality Improvement Organizations (QIOs), run by CMS, will foster reduction of adverse drug events in high-risk populations by expanding community teams focused on people with AD who are at high medication risk because of multiple medications, multiple providers, multiple conditions, or inappropriate or inadequate medication use. At VA facilities, the majority of ongoing primary care for Veterans, including Veterans with dementia, is provided through a patient-centered, primary care provider-directed, multidisciplinary "Patient-Aligned Care Team (PACT)." Geriatric Primary Care is available for frail elderly Veterans with complex medical histories whose need for in-depth attention, often including management of dementia, may not be adequately addressed in general PACT clinics. Inpatient diagnostic and treatment services include a wide range of specialty care (e.g., geriatrics, neurology, mental health, surgery, and other medical specialties). Home-based Primary Care provides comprehensive, longitudinal, primary care by an interdisciplinary team of VA staff in the homes of Veterans with complex, chronic, disabling disease for whom routine clinic-based care is not effective. When appropriate, home hospice care is provided by community hospice agencies and includes comfort-oriented and supportive services in the home for Veterans in the advanced stages of Alzheimer's disease and other diseases. Some VA facilities have developed specialized dementia or other geriatric problem-focused specialty outpatient clinics, which may provide evaluation or ongoing care. The Substance Abuse and Mental Health Services Administration (SAMHSA) is implementing an Older Adult Targeted Capacity Expansion (TCE) program. This program is designed to improve consumers' overall mental health and quality of life. Older Adult TCE helps communities provide direct services and build infrastructure to support expanded services for the behavioral health needs of clients from a variety of ethnic and cultural groups. The program provides direct clinical treatment, long-term services and supports, and prevention services. Additionally, it provides "wraparound" and recovery support services (e.g., community integration and transportation services). SAMHSA also maintains the National Registry of Effective Programs and Practices (NREPP), a searchable online registry of more than 190 evidence-based interventions supporting mental health promotion, substance abuse prevention, and mental health and substance abuse treatment. Its purpose is to connect members of the public with intervention developers to learn how to implement these interventions in their communities. Long-term services and supports help people with Alzheimer's disease with everyday tasks such as eating, bathing, and getting dressed and, in so doing, provide support for their informal caregivers. These services and supports include a broad range of supportive services that may be provided in the home and community, such as home care and adult day care programs, or in residential settings, such as nursing homes, assisted living facilities, or board and care homes. Long-term services and supports generally do not include clinical services that are needed to manage the underlying health conditions of people with disabilities, except when expressly included in a Home and Community-Based Services waiver. The standard Medicaid and VA benefits packages provide a range of long-term services and supports to people who meet certain eligibility criteria. CMS provides long-term services and supports to people who meet specific eligibility criteria. These programs cover care in multiple categories of long-term services and supports. VA provides a range of health care services and supports for eligible Veterans, including those with dementia. Services include in-home, community-based, outpatient and inpatient acute care and extended care services. In general, individuals who served in the active military, naval, or air service and were discharged under any condition other than dishonorable may qualify for VA health care benefits. Once enrolled for VA health care, each Veteran is assigned to a particular priority group, based on criteria such as degree of service-connected disability, income level, and other specific circumstances. There are no separate eligibility criteria for dementia. Services for eligible, enrolled Veterans with dementia are provided throughout the full range of VA health care services. VA provides a standard health care benefits package for all enrolled Veterans that includes home and community-based services such as home-based primary care, adult day health care, homemaker/home health aide, skilled home care, and respite. These services are provided in the community under a system of case management provided by VA staff. Home-based primary care includes caregiver education and support. Adult day health care is provided in VA settings and purchased from community providers. Purchased skilled home care are services provided to Veterans who are homebound and in need of skilled services such as nursing, physical, occupational, and speech therapy, or social services. In-home or institutional respite care can be arranged to temporarily relieve the spouse or other caregiver from the burden of caring for a chronically ill or disabled Veteran at home. Most programs that provide long-term services and supports include but do not target people with Alzheimer's disease exclusively. Two agencies -- the Administration on Aging and the Department of Justice -- identified home and community-based services that exclusively focus on people with Alzheimer's disease. The Administration on Aging administers the Alzheimer's Disease Supportive Services Program. This state-based grant program supports efforts to expand the availability of community-level supportive services for persons with Alzheimer's and their caregivers and improve the responsiveness of the home and community-based care system to persons with dementia. Support provided includes translation of evidence-based interventions into effective supportive service programs at the community level. The availability of services may be statewide or concentrated in targeted communities. The Administration on Aging also administers the National Alzheimer's Call Center. The Call Center provides national information and counseling services for persons with Alzheimer's disease, their family members, and unpaid caregivers. The Call Center is available nationally and operates 24 hours a day, 7 days a week, 365 days a year. The Call Center provides expert advice, care consultation, information, and referrals nationwide. In FY2010, the Department of Justice operated the Missing Alzheimer's Disease Patient Alert Program. This community-based program supports state and local projects that aid in the protection and location of missing persons with Alzheimer's disease and related dementias and other missing elderly individuals. Three agencies, the Administration on Aging, Centers for Medicare & Medicaid Services, and Department of Veterans Affairs, identified relevant long-term services and supports in their portfolios. Most AoA and CMS programs include a state-federal partnership with participation requiring matching funding from the states. These programs fell into four categories: (1) services in residential care settings, (2) home and community-based services, (3) quality and safety, and (4) planning for long-term services and supports. All states are required to cover nursing home care as part of their Medicaid programs. In 2009, 64 percent of Medicaid expenditures for long-term services and supports for older people and persons with physical disabilities were for nursing home care.38 In addition, state Medicaid programs may cover the service portion of residential care facilities through their home and community-based services waivers; room and board may not be covered. In 2009, 37 states covered residential care services through their home and community-based services waivers.39 State Medicaid programs may also provide coverage for personal care services in residential care facilities through their state-plan personal care option; in 2009, 13 states used this mechanism to finance services. Some states use more than one approach. VA participates in three nursing home programs, each of which has unique eligibility and admission criteria. One is the VA-operated Community Living Center (CLC) program (formerly known as VA Nursing Home Care Units). VA CLCs, which are located on or near VA Medical Center campuses, provide a dynamic array of short and long stay services. Services include skilled nursing, rehabilitation, mental health recovery, spinal cord injury care, dementia care, and respite care, among others. Some VA CLCs have established separate dementia units, a physically secure section used exclusively to care for Veterans with dementia. VA also contracts for care of Veterans in community nursing homes approved by VA, with VA staff providing quality oversight. The Community Nursing Home program has the advantage of being offered in many local communities where Veterans can receive care near their homes and families. The State Veterans Home Program is a grant program where a state petitions VA for a portion of the facility construction costs and a per diem for each Veteran served. The state and the Veteran also contribute to the Veteran's care costs. State Veterans Homes are operated by the states, which set specific admission criteria. For example, State Veterans Homes may admit non-Veteran spouses. VA surveys State Veterans Homes for compliance with VA standards. VA also participates in two residential care programs. One is Community Residential Care, which provides room, board, limited personal care, and supervision to Veterans who do not require hospital or nursing home care but are not able to live independently because of medical or psychiatric conditions, and who have no family to provide care. The Veteran pays for the cost of this living arrangement, and VA provides inspection of the home and periodic visits by VA health care professionals. Some VA Medical Centers offer a new version of this program, called Medical Foster Home, in which the Veteran lives in a Community Residential Care home and is enrolled in VA Home-Based Primary Care. Home and community-based services include a wide range of services, including personal care, adult day care, homemaker services, home-delivered meals, respite care, caregiver supports and education, and various assistive technologies. Medicaid home and community-based services waivers (authorized by Section 1915(c) of the Social Security Act) permit state Medicaid programs to offer a wide range of home and community-based services to individuals who require an institutional level of care, including nursing facility care, and meet certain income and asset eligibility tests. Services covered by the waiver may include a wide range of long-term services and supports. Forty-seven states operate 1915(c) Home and Community-Based waivers; one other state covers a similar set of services through a statewide research and demonstration waiver. States may also cover personal care as a Medicaid optional service. Personal care includes help with daily activities such as eating, bathing, and dressing. Medicaid beneficiaries who are eligible for the personal care state option must have a disability, but are not required to need an institutional level of care. States may not limit the number of people receiving personal care services, and there is no federal expenditure limit. States can also offer a variety of services under the Section 1915(i) State Plan Home and Community-Based Services (HCBS) benefit. A handful of states have adopted the 1915(i) option. This Medicaid state plan option is similar to Medicaid home and community-based services waivers, but this option does not require individuals to need an institutional level of care. In addition, CMS's Money Follows the Person program transitions people living in nursing homes and other institutions to homes, apartments, or group homes in the community. Approximately 24 states provide transitional services to individuals who have Alzheimer's. The Administration on Aging identified two programs that serve caregivers of persons with Alzheimer's disease. The National Family Caregiver Support Program funds a range of supports nationwide that assist family and informal caregivers to care for their loved ones at home. The program supports five services: information to caregivers about available services; assistance to caregivers in gaining access to the services; individual counseling, organization of support groups, and caregiver training; respite care; and supplemental services. Services are provided by local community organizations. The Lifespan Respite Care Program helps to support, expand, and streamline the delivery of planned and emergency respite services for caregivers of people with disabilities of all ages. This program also supports the recruitment and training of respite workers and caregiver training and empowerment. Services supported by this program are available in certain localities. VA provides home-based primary care, adult day health care, homemaker or home health aides, skilled home care, respite, and home hospice care to eligible Veterans. VA social workers assist caregivers with accessing support services such as respite care, adult day health services, in-home aide services, and support groups. VA also has a toll-free Caregiver Support Line staffed by licensed social workers (1-855-260-3274). The Support Line can link Veterans or their family caregivers to their local VA medical center to receive services. Quality and safety programs aim to improve the quality of care and quality of life of people receiving services and help ensure that individuals are safe. This category includes all programs aimed at reducing neglect and abuse of persons with Alzheimer's disease who are especially vulnerable to those who might take advantage of their cognitive impairment, and also includes programs which ensure the delivery of quality care. Ensuring quality and safety is addressed, in part, by appropriate assurance systems, including regulatory oversight by federal and state agencies. Both the Administration on Aging's Prevention of Elder Abuse, Neglect and Exploitation Program and the Long-Term Care Ombudsman Program aim to reduce neglect and abuse of persons with Alzheimer's disease and other people with disabilities. The Elder Abuse, Neglect and Exploitation Program strengthens state-based elder justice strategic planning and direction for programs, activities, and research related to elder abuse awareness and prevention. In addition, the program funds training for law enforcement officers, health care providers, and other professionals on how to recognize and respond to elder abuse; supports outreach and education campaigns to increase public awareness of elder abuse and how to prevent it; and supports the efforts of elder abuse prevention coalitions and multidisciplinary teams. The Long-Term Care Ombudsman program provides nationwide support for advocates for residents of nursing homes, board and care homes, assisted living facilities, and similar adult care facilities. The ombudsmen actively resolve problems of individual residents and advocate for changes at the local, state, and national levels that will improve residents' care and quality of life. CMS, in cooperation with the states, has extensive mechanisms to monitor quality in nursing homes and in home health. Nursing homes cannot operate unless they are licensed by the state in which they are located, and they cannot receive Medicare and Medicaid funding unless they are certified as meeting federal quality standards. CMS maintains oversight for compliance with the federal health and safety standards for nursing homes serving Medicare and Medicaid beneficiaries. State Survey Agencies carry out the certification process. To monitor state compliance with federal rules, CMS performs comparative surveys to gauge the performance of the state survey system. A similar process operates for home health agencies. States, rather than the federal government, regulate residential care facilities and non-skilled home care agencies. Preparing to access long-term services and supports requires planning ahead. For individuals without a diagnosis of Alzheimer's disease, this may include planning for a potential need for long-term services and supports, as part of retirement planning, through personal savings, long-term care insurance or legal documentation. For families who have a loved one with a new diagnosis, planning may include using case management services to learn about what service options are available to determine which will best meet their needs. Individuals, families, and supportive service systems benefit from established plans of care for health and long-term services and supports. The Administration on Aging identified several relevant programs. Case management services are available through the Area Agencies on Aging nationwide to assist in assessing needs, developing care plans, and arranging services for older persons or their caregivers. Aging and Disability Resource Center networks serve as sources of information on the range of long-term services and support options for persons regardless of age, income, or disability with one-on-one help in understanding and accessing services and supports. In addition, Legal Assistance Programs protect older persons from direct challenges to independence, choice, and financial security. These programs, available nationwide, help older individuals understand their rights, exercise options through informed decision-making, and achieve optimal benefit from the support and opportunities promised by law. Hebert LE, Scherr PA, Bienias JL, et al.Alzheimer's disease in the U.S. population: Prevalence estimates using the 2000 census. Arch Neurol. 2003;60:1119-1122. Burns A, Iliffe S. Alzheimer's disease. BMJ. 2009;338: b158. Alzheimer's Disease Education & Referral (ADEAR) Center. Alzheimer's disease fact sheet. U.S. Department of Health and Human Services, National Institutes of Health. NIH Publication No. 11-6423. July 2011. Mahoney R, Regan C, Katona C, Livingston, G. Anxiety and depression in family caregivers of people with Alzheimer's disease: The LASER-AD study. J Am Geriatr Soc. 2005; 13(9): 795-801. MetLife Mature Market Institute. Market Survey of Long-Term Care Costs. October, 2011. Maslow K. How many hospital patients have dementia? In Silverstein N and Maslow K, eds. Improving Hospital Care for People with Dementia. New York, NY: Springer; 2006. Magaziner J, German P, Zimmerman SI, Hebel JR, Burton L, Gruber-Baldini AL, May C, Kittner S. The prevalence of dementia in a statewide sample of new nursing home admissions aged 65 and older. Gerontol. 2000; 43(4): 514-520. Yaffe K, Fox P, Newcomer R, Sands L, Lindquist K, et al. Patient and caregiver characteristics and nursing home placement in patients with dementia. JAMA. 2002;287: 2090-2094. Taylor DH, Ezell M, Kuchibhatia M, Ostbye T, Clipp EC. Identifying the trajectories of depressive symptoms for women caring for their husbands with dementia. J Am Geriatr Soc. 2008;56(2):322-327. Lo RY, Hubbard AE, Shaw LM, et al. Longitudinal change of biomarkers in cognitive decline. Arch Neurol. 2011;68:1257-1266. Health Resources and Services Administration website.Geriatrics & Allied Health: Comprehensive geriatric education programs. Available at: http://bhpr.hrsa.gov/grants/geriatrics/. Alzheimer's Association. State government Alzheimer's disease plans. Available at: http://www.alz.org/join_the_cause_state_plans.asp. Accessed November 28, 2011. Bradford A, Kunik ME, Schulz P, et al. Missed and delayed diagnosis of dementia in primary care: Prevalence and contributing factors. Alzheimer Dis Assoc Disord. 2009;23(4):306-314. Gaugler JE, Kane RL, Kane RA et al.Unmet care needs and key outcomes in dementia. J Am Geriatr Soc. 2005;53:2098-2105. Jack CR Jr, Albert M, Knopman DS, et al. Introduction to the recommendations from the National Institute on Aging-Alzheimer's Association workgroups on diagnostic guidelines for Alzheimer's disease: National Institute on Aging and the Alzheimer's Association workgroup. Alzheimers Dement 2011 May;7(3):257-62. Epub 2011 Apr 21. Johnson H, Bouman WP, Pinner G. On telling the truth in Alzheimer's disease: A pilot study of current practice and attitudes. Int Psychogeriatr. 2000;12(2):221-229. Chodosh J, Mittman BS, Connor KI. Caring for patients with dementia: How good is the quality of care? Results from three health systems. J Am Geriatr Soc. 2007;55(8):1260-1268. Banerjee S, Willis R, Matthews D, Contell F, Chan J, Murray J. Improving the quality of care for mild to moderate dementia: an evaluation of the Croydon Memory Service Model." Int J Geriatr Psychiatry. 2007; 22(8):782-788. Cohen CA, Pushkar D. Transitions in care: Lessons learned from a longitudinal study of dementia care. Am J Geriatr Psychiatr. 1999;7(2):139-146. Callahan CM, Boustani MA, Unverzagt FW, et al. Effectiveness of collaborative care for older adults with Alzheimer disease in primary care: A randomized controlled trial. JAMA. 2006;295:2148-57. DesRoches C, Blendon R, Young J, et al. Caregiving in the post-hospitalization period: findings from a national survey. Nurs Econ. 2002;20:216-221,224. Charness N. Matching care to people in their home environments. In The Role of Human Factors in Health Care: Workshop Summary. Washington, DC: National Academies Pressw; 2010. Demiris G. Information and systems in home health care. In The Role of Human Factors in Health Care: Workshop Summary. Washington, DC: National Academies Press; 2010. Mittelman MS, Roth DL, Haley WE, Zarit SH. Effects of a caregiver intervention on negative caregiver appraisals of behavior problems in patients with Alzheimer's disease: Results of a randomized trial. J Gerontol B Psychol Sci Soc Sci 2004;59(1):27-34. Sörensen S, Pinquart M, Duberstein P. "How effective are interventions with caregivers? An updated meta-analysis." The Gerontologist. 2002; 42(3):356-72. Mittelman MS, Haley WE, Clay OJ, Roth DL. Improving caregiver well-being delays nursing home placement of patients with Alzheimer disease.Neurol. 2006;67(9):1592-1599. Kemper P, Harriet LK, Alecxih L. Long-term care over an uncertain future: What can current retirees expect? Inquiry. December 2005;42(4): 335-350. MetLife Mature Market Institute. MetLife long-term care IQ: Removing myths, reinforcing realities. September 2009. Mathematica Policy Research, Inc. Shoring up the infrastructure for long-term care: What do vulnerable adults know about their options? Issue Brief. July 2004. Government Accountability Office (2011). Elder justice: Stronger Federal leadership could enhance national response to elder abuse. Available at: https://secure.ssa.gov/apps10/poms.nsf/lnx/0423022385. Accessed November 15, 2011. Blendon RJ. Georges J. et al Key Findings from a five-country survey of public attitudes about Alzheimer's disease. Poster presented at AAIC, July 2011. Eiken S, Sredl K, Burwell B (2011). "Table U. Distribution of Medicaid LTC Expenditures, All Populations." Cambridge, MA: Thomson Reuters. Available at: http://hcbs.org/files/193/9641/FY2009InstitutionCommunityRankings.pdf. Hyde J, Perez R, Forrester B. "Dementia and assisted living." The Gerontologist. 2007; 47(Special Issue III): 51-67. Mollica L. (2009). State Medicaid reimbursement policies and practices in assisted living. Washington, DC: National Center for Assisted Living, American Health Care Association. Accessed 2012 from http://www.ahcancal.org/ncal/resources/documents/medicaidassistedlivingreport.pdf.